1/2 and 1/2 – He Said What?! Aaron often talks about things being “half” – like when he said he was “half-way losing weight” – or that he’s “half tired” and so forth. Today he walked in the kitchen and said, “Mom, this morning I went outside, but it was half cold and half warm, so I came back inside.” I asked him why he came inside. I then urged him to go back outside. I told him that it was 53 degrees outside…………and I resisted the urge to tell him that 53 is half cold and half warm. I thought about it, though! So outside he went, with his mulch trashcan, and stayed for awhile. 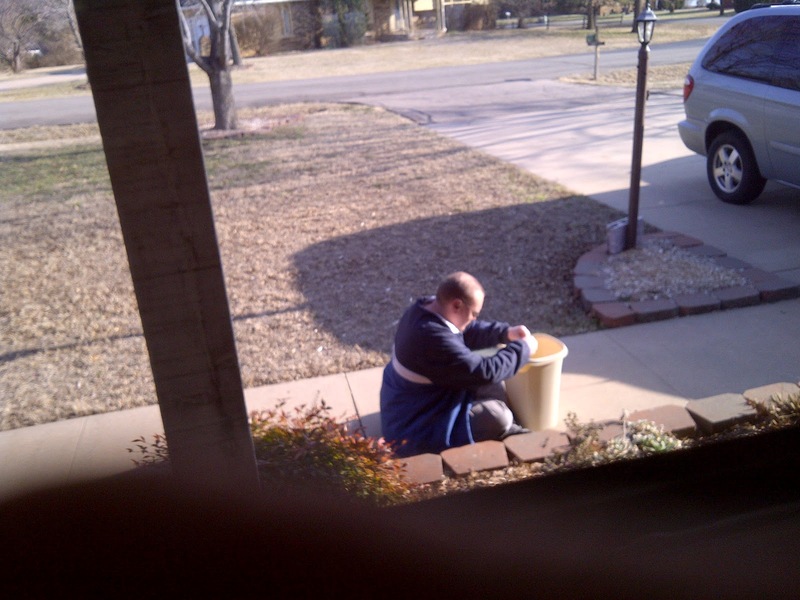 I snuck a picture out the window as he busily “worked” in the mulch and relaxed in the sunshine. I thought it was warm, Aaron. Later tonight I had to ask one more time if he had a good time going outside today. Well, nothing is going to change Aaron’s mind on the half cold/half warm weather today. I think we need to tell the weather forecasters about this. At least their forecasts could be right half the time!